Below is an account from one of our clients experiences on a 3 day retreat, I hope you enjoy. 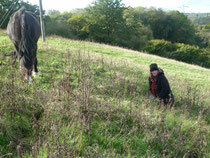 On November 1st 2013, I arrived to do a 3 day retreat with Intuitive Horse not knowing what to expect. I was trained as an actress, so wasn’t sure entirely who the real me was! I had ridden since I was about six years old and owned my own horse in my 40’s, a wonderful fella called Marcus, with whom I had had many adventures until his end at the age of 28! 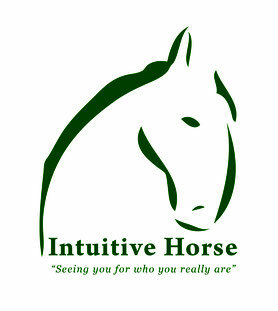 I tend to back out of things if I can, but as horses were involved I found myself at Intuitive Horse with Emma and three other compatriots. The first meeting with my horse whom I chose, was not good. I entered the arena, with completely the wrong attitude- like a showman, acting for my audience, Emma and the others. There I was trying to make the horse come over to me, trying to prove this was easy- I had owned my own horse- I knew what I was doing- boy was I wrong. Disastrous. Ruedi paid me no heed and kept walking off then towards the end I tried to touch him and he tried to nip me. After Emma telling me gently why Ruedi had kept walking away and then became louder in his behaviour towards me, it started to dawn on me how my actions had created that interaction. I went home feeling very despondent. I nearly didn’t come back the next day but decided I would. After a morning of discovery through some exercises Emma introduced to us I decided to choose to work with Ruedi again so I could make things right between us. I was last to go in the group and the weather was getting bad so we were working in an inside arena, which I later christened the Cathedral because of the peacefulness I felt in there during my session…. Emma brought Ruedi into the arena and let him go. This time I blanked out my audience and it was just me and Ruedi in the moment. He clocked me from the other side of the arena and we began. Ruedi walked around for a short while whilst I just stood and watched. He then got down and rolled on the floor in front of me (a great sign of trust), once he had stood back up he started yawning, I found myself yawning with him. Then he walked over to the window and looked out, I found myself walking over to the window to look out with him then sat down and watched him move around the space. I didn’t get to close at this stage, we were still checking each other out after our mishap the day before. He then moved to another area in the arena to look out and I joined him by his side, he looked at me and I at him in a moment of communication and gentleness. We both looked out towards the view, this big beautiful horse then allowed me to touch him and he seemed to enjoy my company as my touch turned into a neck scratch for him. A feeling of warmth and understanding came from him and I thought of my horse dying and started to cry, tears coming down from my face. I don’t cry easily infront of people, he seemed to understand, we were now a team, a bond had formed and I felt elated at the end of the session. All sense of time had stopped and I felt like I could have stayed there forever! On the last day of the retreat we went out into the fields to spend time with the herd. My eyes sought out where Ruedi was and although I wasn’t following him he seemed to keep his eye on me. Emma showed us how to be with the herd in their environment and gradually the herd accepted us. At one point I was near another horse and Ruedi made a direct bee line to see him off then started grazing next to me. He kept looking at me and we moved around the field very slowly together. Ruedi grazing and every so often lifting his head to look at me or come over closer to where I was. He seemed to want to be close to me all the time. I wasn’t asking anything from him, just being with him in his environment. We spent hours with the herd and as the day came to an end I felt a bit bereft as I had to leave the herd and beautiful Ruedi. I felt like I had been on a huge inner journey over the three days, at times a bit uncomfortable but the outcome and feeling was incredible, so much so I wanted to continue working with Ruedi and developing myself so I have been back for a few sessions and my next step now is to have a share with Ruedi which means I will be visiting him once a week to carry on with our journey! Nina's experience with Ruedi really highlights that when we are in a wanting and demanding space from another being and we aren't really taking the time to ask the other, we get resistance. Nina admits to being more aware of her "audience" than the horse therefore she was not being truly authentic with what she was asking from Ruedi. He had given the signals to say no by walking away but when those signals wern't heard and he was in a situation where walking away wasn't so easy, he then had to resort to slightly louder behaviour. Once this was recognised and Nina modified her behaviour Ruedi was very happy to share the space with her and he became very inquistive of Nina on day two and day three in the herd. Seeing many people work with our horses and have their own discoveries it is truly magical to witness the exchange between both human and horse and how on this occasion the horse seeked the human out on day three even when he was in his own environment (in 50 acres) in which he could have moved away and made it clear he didn't want any interaction. Their journey together had made an impact on him in some way and a lovely bond formed and is still there now. Thank you for sharing your story Nina. I am really impressed with your writing skills and also with the layout on your weblog. Is this a paid theme or did you customize it yourself? Anyway keep up the nice quality writing, it is rare to see a great blog like this one nowadays. This web site certainly has all of the information and facts I wanted concerning this subject and didn't know who to ask. Heya this is somewhat of off topic but I was wanting to know if blogs use WYSIWYG editors or if you have to manually code with HTML. I'm starting a blog soon but have no coding know-how so I wanted to get advice from someone with experience. Any help would be greatly appreciated! Hi there, all the time i used to check website posts here early in the dawn, for the reason that i like to gain knowledge of more and more. Your mode of describing everything in this post is in fact nice, all can simply know it, Thanks a lot. If you want to get a great deal from this post then you have to apply these techniques to your won weblog. Having read this I thought it was really informative. I appreciate you finding the time and effort to put this short article together. I once again find myself spending a significant amount of time both reading and posting comments. But so what, it was still worthwhile!